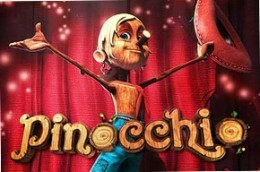 As the name already says it clearly, Pinocchio is an online video slot with a theme inspired directly by the story “The Adventures of Pinocchio” of the Italian writer Carlo Collodi’s “The Adventures of Pinocchio”. The game is a 5-reels with 3 rows and 15 paylines slot that was created by Betsoft. Pinocchio is playable on all devices including PC’s, Macbooks, tablets, and iPads. The higher value symbols are represented by two versions of Pinocchio(wooden and real), a cuckoo clock, a wood plane, a poster for The Great Stromboli, and a caged creature. On the other hand, the lower value ones are represented by the usual playing cards (10, J, Q, K and A). A traditional caravan, Geppetto, a pile of books, and Pinocchio are the special symbols of this game.